It's day 17 of #DollyDowsieChristmas and today's prize is perfect for little ones who love to play pretend! The Wannabees range is perfect for inspiring ‘playing for real’. 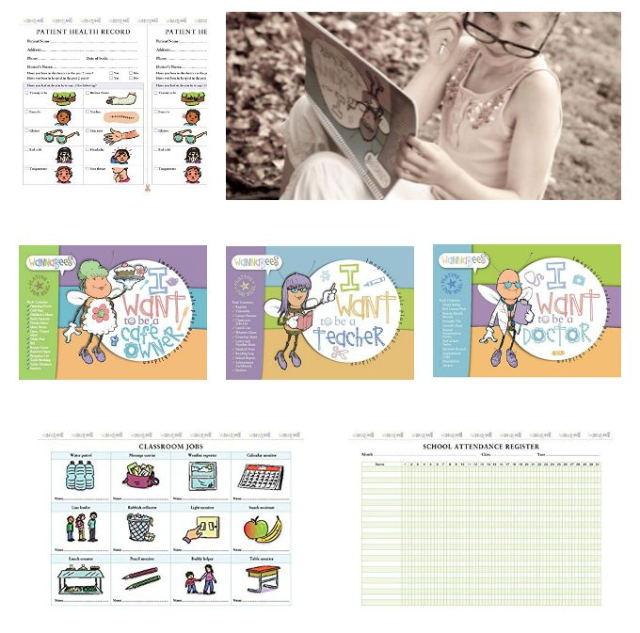 The award-winning Wannabee Range for ages 5-11 year olds provide everything children need to ‘pretend’ to be the profession of their choice. They contain lots of exciting forms to fill in, stickers, and certificates that children will need to feel like they are truly ‘playing for real’. Priced at just £14.99 they are the perfect gift for any youngster who loves to role play. The love people at Wannabees have very kindly offered one lucky winner the chance to win three Wannabees packs, this is a prize worth £45! To be in with a chance of winning simply enter the giveaway via the Gleam widget below. Please read the terms and conditions before entering a best of luck to all who enter! 2. This giveaway will run for two weeks and will end on December 1st at 11.59p.m. - a winner will then be chosen at random via the Gleam widget. At the moment my granddaughter likes to pretend she is in the kitchen cooking and feeding everyone who will open their mouth. Our little dog-obsessed dog-whisperer pretends she's a dog. It does vary though. Yesterday it was a poodle called Polly. Our grandson likes to play as a fireman? my little Grandson pretends he is a magician, he has a few tricks that he can execute perfectly! My grand daughter pretends ahe is a princess and i am her slave. working well so far!!! Ollie loves to pretend he is George pig ! Violet likes to be an executive going to a meeting with her ipad! My sons likes to pretend he’s an astronaut. My little granddaughter pretends she is a dog trainer and practises on their dog! My son likes to pretend to be a teacher and my daughter loves to be mummy or a vet! My daughter Lola loves to play teachers. She is 5 and wants to be a teacher when she gets older. My granddaughter like to be the waitress and bring us food and drinks! He likes to pretend that he’s making me dinner. Fashion designer at the moment lol Thanks for the chance. My little man is really imaginative - often when he's been to school, he'll pretend to be a teacher, but he's often pretending to be a doctor, a taxi driver, a fireman, a policeman - pretty much anything that he can think of! Bertie wants to be Elsa....my Father is mortified haha!